The La Roche College Archives was officially recognized on April 3, 1979, when it was announced by President Mary Joan Coultas that the first archivist of the college would be Sr. Mary Kenneth Kearns. Prior to that time, Sr. Georgine Sieber and others would collect newspaper clippings, memorabilia and other important papers of the college in the hopes of one day starting an archive. 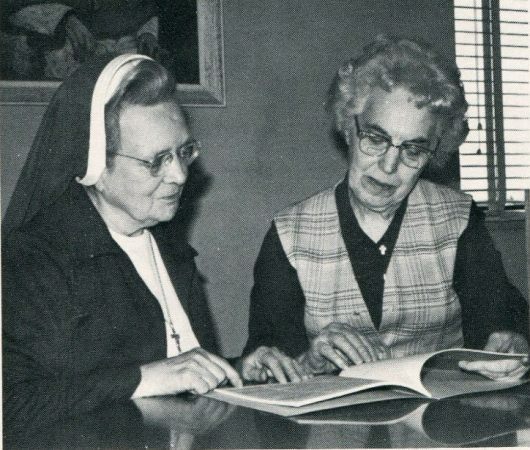 Sr. Mary Kenneth (left) was the driving force behind the establishment of La Roche College and was the perfect choice to begin preserving the history that she and others had created. She was joined by Sr. Alma Haberman (right) who was the Assistant Archivist.